Shravanabelagola is one of the most popular Jain pilgrimage destinations in South India. Shravanabelagola gets its name from the pond in the middle of the town - "bela" means white and "kola" means pond, colloquially "belagola" in Kannada. 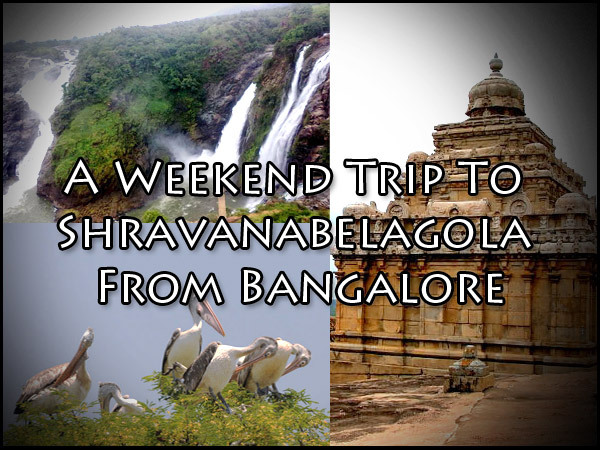 This is one of the most popular weekend getaways from Bangalore. Shravanabelagola is famous for the Bahubali Statue, the tallest monolithic stone statue in the world with a height of 57 feet, carved out of a single block of granite. The Gomateshwara temple is built on top of a hill, at an altitude of 3347 feet, called the Vindhyagiri hill (also known as Indragiri). The bare statue of Bahubali is carved with utter perfection. By Air: Kempe Gowda International Airport in Bangalore is the closest airport to Shravanabelagola. You can take a taxi from there. By Rail: Hassan Railway Station is 50 km away from Shravanabelagola and is the closest. By Road: There are many buses which ply from Bangalore to Shravanabelagola. Alternately, you can also take a bus till Hassan and take another bus from there to Shravanabelagola. Route1: Bangalore - Kunigal - Yadiyur - Hirisave - Shravnabelagola, clocking 2.5 hours and 143 km via NH 75. Route 2: Bangalore - Magadi - Kunigal - Hirisave - Shravanabelagola, via SH 94 an NH 75. The distance is 172 km and it takes approximately 3 hours 15 minutes to reach Shravanabelagola without any detour. Route 3: Bangalore - Ramnagar - Channapatna - Mandya - Melukote - Shravanabelagola, via NH 275 and SH 47, taking 3 hours 30 minutes or thereabouts and panning 173 km. Route 1 is shorter than the other two routes by 30 km. It also takes lesser time to reach the destination. However, when it is a weekend trip and you have some time to spare, you can take Route 3, stopping to explore other beauteous locations on the way to Shravanabelagola. Have a hearty breakfast at any of the Dharshinis and start from Bangalore. You can make a pitstop at Ramnagar and hike up the Ramdevara Betta. This is a great trekking spot. Hat tip: This is where the famous Hindi movie Sholay was filmed. There is a temple atop the hill where you can offer prayers post trekking. Driving further, Channapatna is famous for wooden toys and lacquer-ware. It is aptly called the "Town of Toys". It is said that Tipu Sultan invited artisans from Persia to train the local artisans in the making of these toys. The Government of India has issued a Geographical Indication tag for these toys. Do pick up a few toys for children and support local artisans. These toys have no sharp edges and are painted using vegetable dyes, so they are completely safe for babies and toddlers. Stop at one of the highway hotels for a Maddur Vada and coffee. The vada is very famous and delicious in this region. Next stop is Mandya, which is famous for its sugar production. Gaganachukki and Bharachukki falls here are famous and beautiful. Daria Daulath Bhag - what used to be Tipu Sultan's summer palace and now maintained by ASI - has some amazing structural art from Tipu's period. It also has some of his personal belongings. Be warned that photography is banned inside the Dariya Daulath Bhag. There's Kokkrebellur Bird Sanctuary if you are an avid bird watcher. It is best visited between December and March, as it is the nesting period for the birds. You can travel further and reach Melukote. This small town is famous for Cheluvanarayanaswamy temple, atop a small hill. The presiding deity Cheluvanarayanaswamy is believed to have been worshipped by both Lord Rama and Lord Krishna. Shravanabelagola is 35 km from Melukote, and it takes approximately 45 minutes to reach the place via SH 47. The belagola/pond is bound by two majestic hills called Chandragiri and Vindhyagiri. Most of the monuments are located in these hills. There are many basadis within the town as well. (Basadi is a Jain temple/shrine.) The main temple of Gomateshwara is located on the Vindhyagiri hill along with Odegal Basadi, Tyagada Kamba, Siddhara Basadi, Chennanna Basadi, Akhanda Bagilu, etc. Odegal Basadi has images of Jain Tirthankaras Adinatha, Neminatha, and Santinatha. Few steps further from Odegal Basadi is the Gomateshwara statue. Relax while watching his peaceful face and pay obeisance to him. Gomateshwara/Bahubali was the son of the first Jain tirthankara named Lord Adinatha. Lord Adinatha had 99 other sons and when he renounced the kingdom, there was a quarrel between the two brothers, Bahubali and Bharatha, over the kingdom. Bahubali won this battle, but he did not derive any happiness out of it. He then handed over the kingdom to his brother Bharatha and then attained Kevalagnana. Climb down the Vindhyagiri hills and proceed to the Chandragiri hills. It is home for about 14 shrines, among which Chamundaraya Basadi, Chandragupta Basadi, Chandraprabha Basadi, Kattale Basadi and Parshwanatha Basadi are important. The great Mauryan emperor Chandragupta Maurya spent his last days in Shravanabelagola after becoming a follower of Jainism. His grandson, Emperor Ashoka built a basadi for him on Chandragiri hill in 3rd Century BC. This trip, filled with history and heritage will surely linger in your mind for a long time to come.